If an extremely powerful subwoofer is required this speaker needs to be able to move a lot of air. This can be achieved by a large diaphragm (or several smaller ones) and a big excursion. Big excursion (or long throw) is commonly found in larger loudspeakers. The Monacor SPH-450 TC bass driver is one of this type. The driver features a twin voice coil with 2 x 4 Ohm. A power handling of 700 Watt RMS. The driver supplied with this kit was optimally tuned for hi-fi and home cinema. This gives you - even after completion - the opportunity to go for low bass or precision. The bass reflex version are optimised. The subwoofer achieves now 21 resp. 26 Hz (-8 resp. -3 dB). Despite a massive peak linear displacement volume of 1600 cm3 (diaphragm surface area x voice coil overhang) the subwoofer should not be tuned any lower, otherwise the diaphragm will starts wobbling. This effect is easily noticeable in the closed cabinet version. Here the speaker leaves the linear range at more than 250 Watts and 20 Hz. The bass reflex version uses the rear radiation as well and around the resonance of the bass reflex tube this rear radiation contributes double to the volume compared to the front radiation. Therefore, the bass reflex version shows a considerably higher sound pressure level. 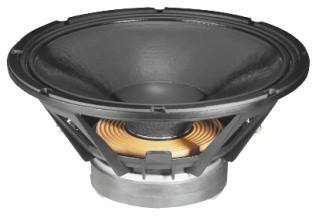 - or Hypex HS 500 (720 Watt RMS into 4 Ohm). The low bass properties of the DT300 are adjustable. We recommend, however, to use the neutral factory setting first. We believe it's the best setting for low bass and high volume. For high performance, this is the right subwoofer. If this is still not enough we suggest to use two or four of them. 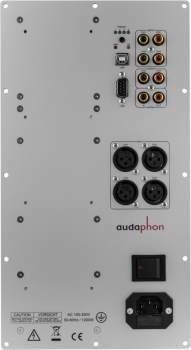 The kit is also available with amplifier Audaphon AMP-24 with digital signal processor (DSP) and power amplifier (bridged it provides 180 W RMS at 8 Ohm). The kit is also available with amplifier Audaphon AMP-2500 with digital signal processor (DSP) and power amplifier (bridged it provides 1000 W RMS at 8 Ohm) or 2 x 500 W RMS. Closed cabinet versions with 2 x 4.5 Ohm resistors (consisting of 20 resistors of 12 Ohm, five resistors in parallel, and two of these items in series to the woofer). 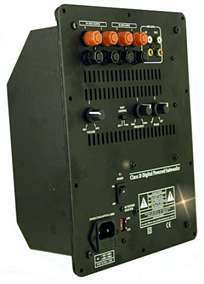 Or you use the digital signal processor to emphasize the bass. Please contact us for further versions or if you want something similar.